Halve cherry tomatoes, then quarter each half. Peel onion and garlic and chop finely. Transfer to a small bowl. Add oil and lime juice and stir to combine. Chop parsley and add to the bowl. Season with salt and pepper. Set salsa aside. Crack eggs into a large bowl and beat until well combined. Add Gouda and heavy cream, and stir thoroughly. Season with salt and pepper. Melt butter in a pan over medium heat. Add egg mixture to the pan and cook slowly for approx. 10 min. Scramble eggs with a cooking spoon until cooked through but still slightly moist. In the meantime, halve and toast the English muffins. Peel avocado, remove the pit, and mash with a fork. Season with salt and pepper. 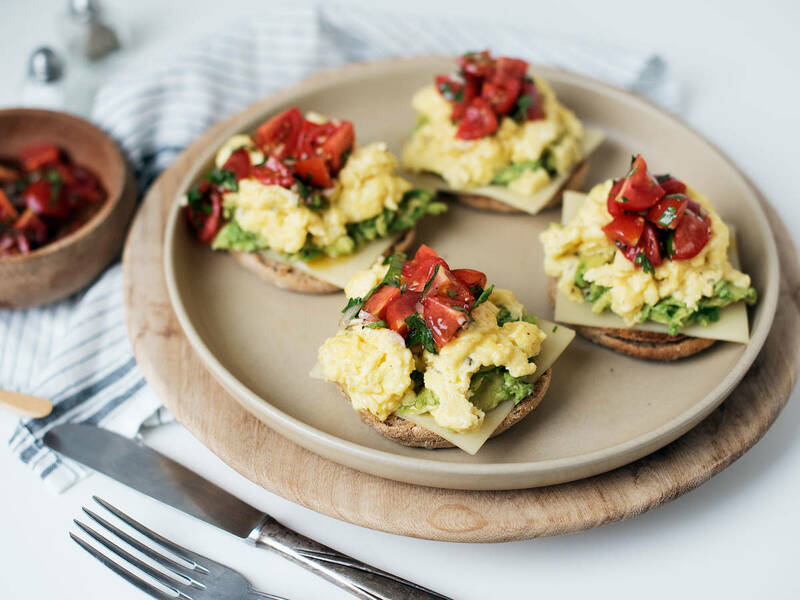 Top each halved English muffin with a slice of Alpine cheese, some avocado, scrambled eggs and salsa. Enjoy!